Adam Webster has been on WORC-FM since 2000. 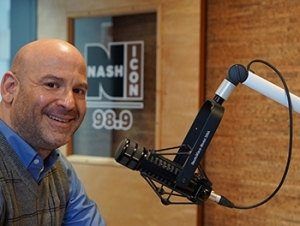 In addition to hosting the Morning Show on 98.9 Nash Icon, he is also heard on sister stations 104.5 WXLO and 100.1 The Pike delivering the morning news. Adam enjoys making people laugh and looks at life on the lighter side. He is the game night arena host at Worcester Railers hockey games, which he also did for the the Sharks and Ice Cats. Adam lives with his wife in Worcester where they enjoy everything Central MA has to offer, including kayaking, biking, hiking and great restaurants. Since he moved to Massachusetts, Boston sports have experienced 6 Superbowl wins, 4 World Series Championships, a Stanley Cup and a NBA Championship, so let’s keep him around!